Combine settings can be a big factor in reducing canola losses during harvest. So how well do you know your combine and its best settings for canola harvest? And do you know how to adjust settings to reduce losses as conditions change throughout the day? Winter is a good time to review the combine manual and check with the manufacturer for tips to fine-tune concave, fan and sieve settings for canola. Whether you are running brand new equipment, equipment that has years of experience or are an agronomist working with farmers there will be valuable take aways to help maximize net return during harvest. –Concurrent Combine Session (90 minutes). Choose your brand: CASE, Gleaner, New Holland, Claas or John Deere. Or choose the ‘Mechanics Special’ session on Optimizing and Maintaining Your Experienced Combines. CCA and CCSC credits will be available. Rebate. 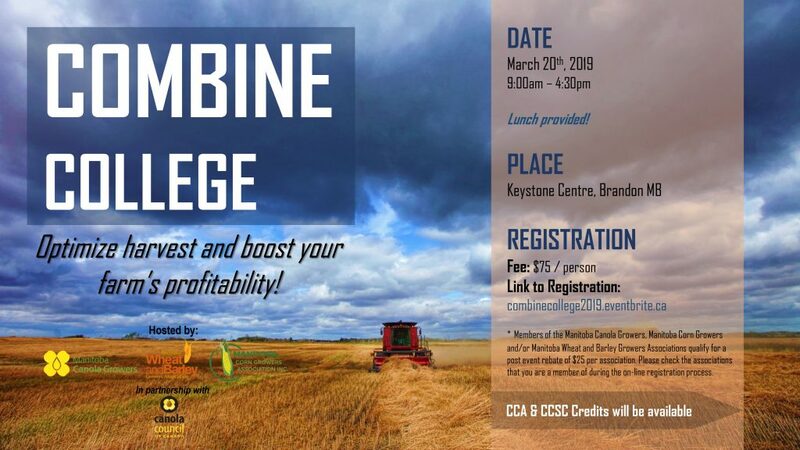 Members of the Manitoba Canola Growers, Manitoba Corn Growers and/or Manitoba Wheat and Barley Growers Associations qualify for a post event rebate of $25 per association. Please check the associations that you are a member of during the on-line registration process.